It’s nearly summer, and Parquet Courts are determined to start the season off with a musical flair. Wide Awake! is a collection of just about as many musical influences as I’ve ever heard in an album, brought together with style and strong musicianship to create a solid release. A. Savage has a unique vocal style that drives the sound of the band, but sharp drum fills and sturdy guitar licks create a tight rock feel. If you’re into no-nonsense, faultlessly executed rock n’ roll, then Wide Awake! might be just what you’re looking for. Listening to Parquet Courts is a lot like walking through a CD store. In fact, Wide Awake! is exactly the kind of album I want playing at Graywhale as I’m flipping through their racks of music. It’s like Parquet Courts give me little samples of a bunch of different genres. From funky grooves to head-banging grunge, it’s just as though I’m sampling different albums all across the store. It’s hard to identify consistencies across this album other than the vocal style and the quality of musicianship, but each song flows into the next so well that the journey is as seamless as it is diverse. There is so much variety throughout this album that I can’t help but be impressed by Parquet Courts’ broad musical knowledge. Parquet Courts have a bit of it all, everything from crystal-clean piano lines to crushing electric guitars. Wide Awake! is almost like a musical time machine through the history of rock. “Violence” is reminiscent of those old Gil Scott-Heron vocals with a strong and direct message from “The Revolution Will Not Be Televised,”. “Mardi Gras Beads,” on the other hand, kicks up the guitar effects and brings in a The Black Keys vibe. What really works for Parquet Courts is their ability to string together sounds and techniques from all walks of music. Savage’s vocal style is often grungy, but the band plays so tight that most of the songs on Wide Awake! are as clean-cut as any of the songs played by bands like The Strokes or The Presidents of the United States of America. Parquet Courts know what good music sounds like, and each song on this release is skillful and entertaining, but Wide Awake! lacks the push that would help it stand out from the pack. In other words, every song on this album is good, but none of them are great. Every time I listen through, I long for a crazy guitar solo or a rhythmic break that sticks out as truly exceptional. Instead, it seems like Parquet Courts played it safe. Ringo Starr is renowned not because he was a superb drummer, but because he never played a wrong hit. 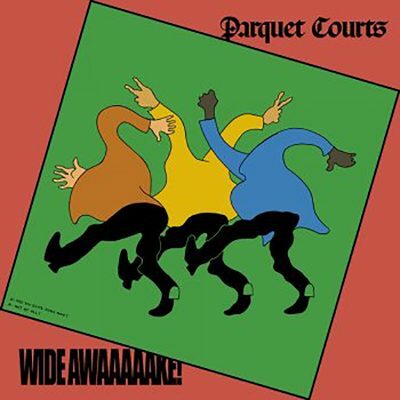 In much the same way, Parquet Courts never play anything wrong on Wide Awake!, but the album began to feel a little lackluster after I’d listened through a half dozen times.